In addition to the design of the referendum question, this study also examines the context of referenda when voters voted no, and when they voted yes. The case of New Zealand is instructive; it demonstrates that a well-crafted referendum process with informed consent of the public and with the desire for change can result in electoral reform. To have a meaningful and legitimate mandate, this study recommends that the government follow the New Zealand example and have two referenda on electoral reform, with the first having two questions. Referendum 1 would consist of one question asking whether there is appetite for change, and a second question asking which system the public would like to change to. 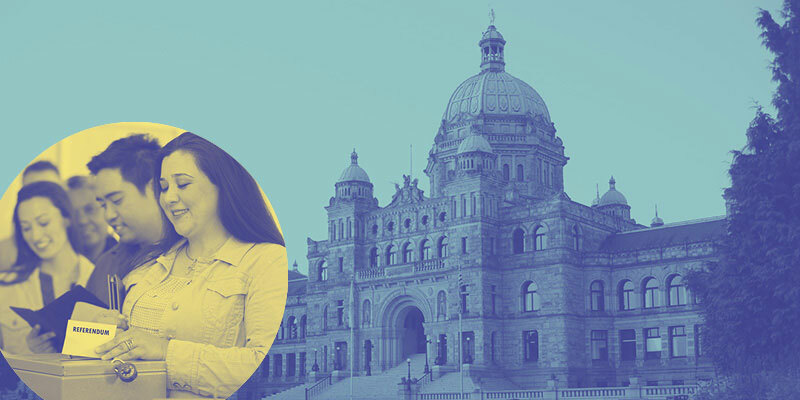 Referendum 2 would offer a choice between the existing system and a new electoral system that has been developed for British Columbia; the later would contain all details including electoral boundaries and rules regarding coalition and minority governments. By separating the question of reform from the type of system, the government will have the information it needs to proceed with a new electoral system. The second referendum is the only way the government can fulfill the criterion of having the electors informed about the effects of the referendum. Only by providing two opportunities to assess the proposal will the government be able to fulfill the best practices for designing a referendum. More importantly, if the public agrees to change the system, the second referendum will give the new electoral system higher legitimacy and ensure it has a greater chance of not being changed by subsequent governments. Giving the government or an external body time to craft an electoral system that works for British Columbia, then ensuring the public learns about the system including its benefits and drawbacks as compared to the benefits and drawbacks of the current system, and then having the public vote on those changes, is the only legitimate way of proceeding with electoral reform. The premise of a fair referendum is that members of the public are aware of the consequences of their choice. An open-ended question regarding the desire for change to an unspecified system does not satisfy the criterion of informed choice. In addition to the wording of the question and the way the referendum is conducted, this study also examines whether there should be voter turnout thresholds or a super majority vote. Although the government has stated that the referendum will succeed with 50-plus-one percent of the vote, we urge caution in proceeding with electoral reform on that criterion alone. The government should not consider the results binding if voter turnout is lower than is typical in provincial elections. Turnout of less than 50 percent would impair the legitimacy of the result. If, for example, only 36 percent of voters turned out (as was the case in PEI) and 51 percent of them supported changing the system, it could mean that the province was proceeding to change the electoral system with the support of less than one fifth of the electorate. In such a scenario, it would be impossible for the government to say it had a clear mandate for change. Therefore, the government might want to consider the impact of a low voter turnout before declaring that it has a mandate for change. More problematic is the removal of a regional requirement. Given the high population density in the Lower Mainland, the referendum’s outcome could be determined by just a few ridings. Status quo bias should also be taken into consideration. If the public is concerned about partisan manipulation, it is more likely to vote to retain the current system. Having a two-question ballot with the promise of a binding referendum on a specific electoral system will elicit a clearer picture of the public’s attitude. In addition, that process would provide much-needed legitimacy for the adoption of a new system. Moreover, the binding referendum on a specific system should require some threshold of voter turnout and regional support to further ensure legitimacy for the chosen system.